This Copenhagen accommodation is located in the center of the city and is near a variety of famous sights and attractions, including Tivoli Gardens. There are also many restaurants and cafes located in the vicinity near the Du Nord Hotel Copenhagen. Guests will also have easy access to the many entertainment venues in the local area as well as a variety of shopping opportunities. 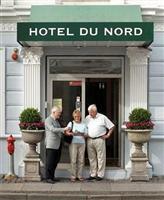 Paid parking is located near the Du Nord Hotel Copenhagen for the convenience of guests who arrive by car. The airport is located within a short drive of the hotel. Public transportation services are also available in the area. The hotel also provides car rental services for the convenience of guests who would like to independently explore during their stay. There are 65 spacious guestrooms at the Du Nord Hotel Copenhagen. Each of the guestrooms includes amenities such as tea and coffee making facilities, hair dryers, pay movies and cable television. Amenities offered at the Du Nord Hotel Copenhagen include a 24 hour front desk, free high speed Internet service, currency exchange services and tour assistance.